This week's challenge is being sponsored by the Regina Easter of The Cutting Cafe. The winner will be drawn at random from all our entries this week. They will be able to pick 3 kits of their own choice from The Cutting Cafe online store. The Cutting Cafe offer a wonderful selection of downloadable stamps and templates .... at really fabulous prices! The galleries on the site are also amazing and offer endless inspiration! I used the STATIONERY BOX kit to make my first item this week. This is a little 'Christmas Present' of a box of Thank You cards. The templates are straight forward to use and are very versatile. This kit comes with several different options for the lid. I used the 'frame' template and cut the design from the lid of my box. I then also used the same template for creating mats for my cards. The vellum envelopes were made using another template in the kit. Most of the products used are from Stampin' UP! Don't forget to visit all the other DT's fab creations this week! 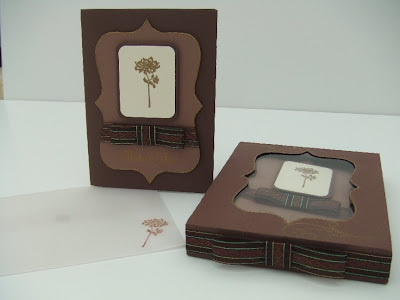 WOW Teri what a great set to give for christmas...love the chocolate color of your set...soooo beautiful, and your card is a beauty for sure!!! hugs! Oh wow ( like Crystal said ) I'll even add a double wow! That is a marvelous gift set. I love the richness of the chocolate paper and the way you used the top note. Just fabulous!!!! The card is adorable too. I love the patterned paper!! gorgeous. and the colors are so pretty together. You sure have " it"
Teri, that box set is absolutely STUNNING!!! I really gasped when I saw it - the colours are just perfect and I love the cards inside! Absolutely fantastic!! 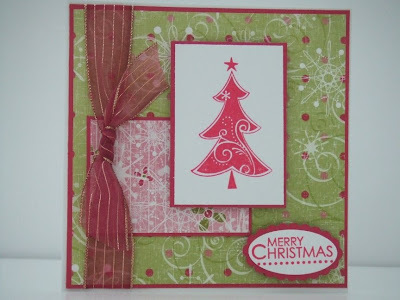 Your 'Present' card is wonderful too - great colours and LO!!! 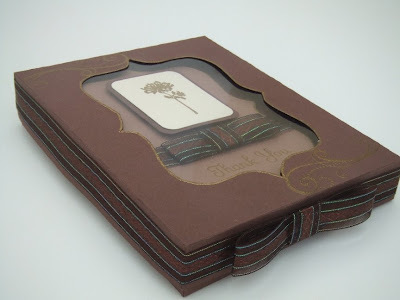 Gorgeous cards and I LOVE your stationery box, what a great idea for a gift.